If it seems like I have been doing very little sewing - your are absolutely right! My goodness, transferring from the old to the new computer has been a big deal - poor son-in-law and I had a few very serious disagreements, but at least here we are. Oh, I guess only 3 days to get completely set up is not too bad! 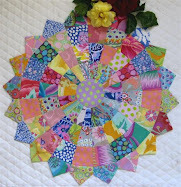 I have gone pincushion crazy lately - Heather Bailey's fabulous pattern! - to date, two pears and one apple. Wow, it is a great pattern! The apple is sculpted - see the indent in the bottom and it sits beautifully, too! 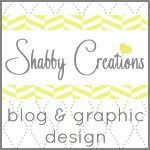 Preparation for a shaggy baby quilt - hope to get some sewing done today! We are currently going through some of the worst weather I have ever experienced - very squally wind and rain - but then, we live a 10 minute walk from the Indian Ocean, so we are really copping it. When I lived in the tropics, I went through several cyclones and it was as bad as this - we even had a tile fly off our roof at 4am and were so lucky to have Emergency Services come out and temporarily patch the spot up with a tarp and sandbag. It should all settle this afternoon - let's hope so! I will be able to read so many more blogs now and answer emails so much more quickly now I have this speedy little girl to help me on may way - really looking forward to it! 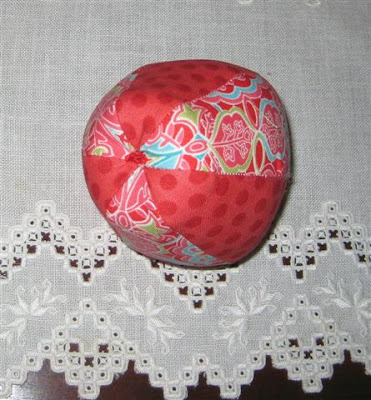 Darling pin cushions and love the fabric for the baby quilt! What do you stuff your pin cushions with? Just plain polyester fiberfill or something just for pin cushions? Hope you make out ok with the weather! I love the pincushions you are making! And the fabrics you use to make them with! I love the apple, I was looking forward to seeing it. I like the choice of fabrics you used. I have PC upgraded too and know how frustrate it can gets! Love the pin cushion..perfect shape! Glad your computer is up and running as you like it...the speed will make a big difference for you. Boy, she's blowing a gale outside, luckily we have not had any damage..
Love the apple, glad the roof stayed on and your computer is up and running. Lurline I got the pattern in the mail today and will try and sort out a background for it so I can get started picking the other fabrics. The apple is very cute but I LOVE your hardanger doiley - gorgeous. I hope all is safe at your house. The weather sounds like the kind where you need to hibernate indoors. The apple pincushion worked up beautifully. Such a cute pincushion. Love it. Is the bird in the background a pincushion too?? What a lovely pincushion you have made, it looks delicious. Liking the squares for your shaggy baby quilt also. Glad the computer is playing nice for you. 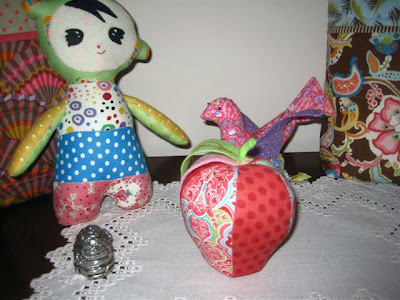 Thanks for sharing the apple pincushion - it's really adorable. I love the fabrics for the baby quilt too. Congrats on getting the computer and I hope your weather improves. Enjoy your day Lurline! Enjoy your new computer, Lurline. Your apple pincushion is just darling and I love the realistic shape. Having lived through two major hurricanes when we lived in Florida, I can sympathize with you and the weather you are experiencing. Hang in there. Hopefully it will pass without causing too much damage. 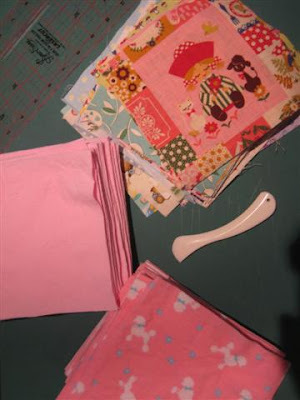 Lurline, I love the pincushions and the fabric for the baby quilt is just adorable. Glad your internet service is much faster now. You might not be getting much sewing done but you are making some gorgeous wee things. Enjoy your new computer and make up with sil, lol. I hope your weather improves, we've been enjoying warm sunshine here. 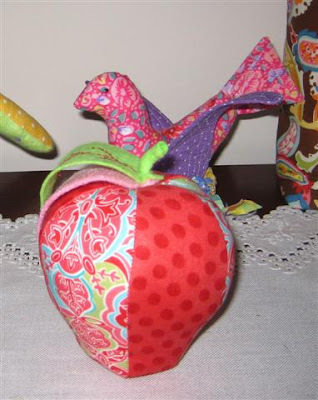 Love the apple pincushion! Stay safe -- hope the weather changes for the better! Those [pincushions are really cute. Nice fabric too. Yes, installing a new computer is so difficult, and one day or another we all have to deal with it. I love your pincushion...and the cute bird behind it! Oh, and did you also do the hardanger on the table...I used to do quite a bit of that as well...it's lovely! Love the pin cushion. I might have to invest in that pattern. I love the pincushions! It is just gorgeous! Holy Cow that is so so so amazing! I love the pincushion. It is beautiful. Your pincushions are lovely. I have only one so it travels from room to room with me. And I do understand about changing computers. I get really excited about getting a new one and then realize what I have to go through to get it up and going. and found that it's really informative. I am gonna watch out for brussels. I'll appreciate if you continue this in future. or plugin that might be able to resolve this issue. The place else may I am getting that type of info written in such an ideal approach? I'm getting fed up of Wordpress because I've had problems with hackers and I'm looking at alternatives for another platform. I would be fantastic if you could point me in the direction of a good platform. I feel that is one of the so much significant info for me. and exposure! Keep up the terrific works guys I've incorporated you guys to my own blogroll. Look at my webpage LLC. :: Poptops :: Silver Plated Cross Shield 40% OFF! Green Tea and Sweet Beans - June! Where Did The Week Go?